You have probably seen the bright yellow bumper stickers reminding you to watch for motorcycles, but how closely do you follow this advice? Are you aware of the best way to watch for motorcycles, how to safely follow them in traffic and avoid an accident with one? As riders are taking advantage of the warmer weather, you can’t afford to leave these questions unanswered. More than half of all fatal motorcycle accidents involve another vehicle. Don’t be responsible for a motorcycle accident; learn how to watch for motorcycles from these tips. Motorcycles have slimmer profiles than cars, making them harder to spot at times. Because of their smaller size, motorcycles can appear farther away in mirrors, or completely invisible in blind spots. In addition to being more difficult to see than trucks and cars, motorcycles and riders perform differently than other vehicles and drivers, which may cause drivers to interpret their behavior as erratic. However, understanding some fundamentals about motorcycles can give you some insight into why riders may behave differently on the road. You may have seen riders who swerve, seemingly unnecessarily, on the road. Once again, a motorcycle’s small size and open structure come into play. There might be hazards on the road, which to you, driving in your car, are hardly noticeable, but would cause real damage to the rider if he or she were to try to plow through it, such as a pot hole, debris or loose gravel. 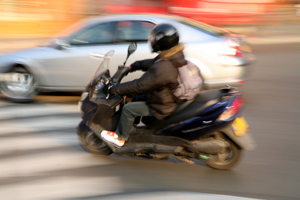 The short answer is that you should always keep an eye out for motorcycles, but there are two instances in which you need to take extra precautions to ensure that you do not collide with a motorcycle. The first is whenever you make a left turn at an intersection. Because of their smaller size, many drivers may miss seeing motorcycles that are traveling in the opposite lane, which can lead to an accident. Other drivers might see the motorcycle but may think that they can make the turn before the motorcycle reaches the intersection. It is better to let the motorcycle pass before turning, as it is harder to judge a rider’s actual speed. The other instance in which you should take extra care for motorcycles is when you are traveling behind one – or several. As we have said earlier, riders may adjust their position in the lane frequently to avoid road hazards. In addition, motorcycles are also capable of stopping more suddenly and faster than other vehicles, so it is best to leave extra distance between your car and the motorcycle in front of you in the event of a sudden stop. Also, bear in mind that riders can stop without signaling with their brake lights, so it is vital to pay attention to the rider’s speed and not to rely on just their lights. Now that you know the why and the when, here are some tips for how to better watch for motorcycles. If you or a loved one has been involved in a motorcycle accident, count on KBG Injury Law to get you the Results You Deserve®. Contact us 24 hours a day, 7 days a week.